Dr. Mohammad Javad Zarif has served as the Iranian Foreign Minister since 2013. He held many prominent positions as a diplomat, politician, and professor in Iran. He was born in Tehran in 1960 and as a teenager Zarif traveled to the United States where he earned both his BA and MA in International Relations from San Francisco State University in 1982. He earned his PhD in 1988 from the University of Denver in International Law and Policy. Because of his English language skills and his familiarity and relationships in the US, he became a junior diplomat for Iran to the UN in 1982, when only 22 years old. 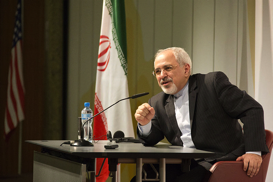 When asked who he felt were exemplars of love and forgiveness, Zarif mentioned Nelson Mandela. He quoted Mandela’s philosophy of “we may not forget but we will forgive.” However, the great and well-known models like Mandela were not the only examples that Zarif mentioned. He said there are great and powerful examples of love and forgiveness in our everyday lives. According to Zarif, one of the best ways to start down the road to forgiveness is to start small and locally. Zarif argues that in order to forgive, one needs to exercise love and forgiveness from within, in one’s family, in one’s own society and then try to see if one can make it more inclusive. But everything starts from an individual and community. Zarif acknowledges that love and forgiveness in today’s world comes with many challenges and obstacles. He discussed several keys that he feels are important to practicing love and forgiveness. One such key is “to move yourself beyond the immediate situation and to look from a wider perspective.” Often when caught in a conflict, people focus only on the immediate situation and get locked into hatred and continue the conflict. To move beyond the conflict, to “think outside the box” and look at the wider perspective is the key. Otherwise you will perpetuate conflict and you will perpetuate hatred and you will be entrenched in a position that will make impossible any movement forward. When asked what recommendations he has for people working in a governing position, Zarif said, “I recommend to everybody in government to understand that they are not prisoners of the situation, but that each practitioner is an actor who can influence the outcome. The outcome is not predetermined, we determine the outcomes and we can make a different outcome.” He mentioned that in today’s world, “Some of us believe we are prisoners of super powers, of circumstances, of rigid international climate.” This is simply not true, he argues, and says that many examplars, such as Gandhi, prove that one does not need to be a prisoner of circumstances. People are not prisoners of realities; we make realities.